38 5/8 by 51 1/8 in. 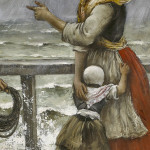 In Goeneutte’s painting the foaming spray almost envelopes the viewer as well as the fishermen and young mother hiding the face of her terrified child from the scene unfolding before them. Norbert Goeneutte began his artistic career as a student of Isidore Pils at the École des Beaux-Arts, but left after Pils’ death when the school was taken over by Henri Lehmann to move to Montmartre. There he made the acquaintance and later established a close friendship with Renoir, appearing in several renowned Renoir compositions, and Marcellin Desboutin, who sparked Goeneutte’s interest in engraving, etching and dry-point. 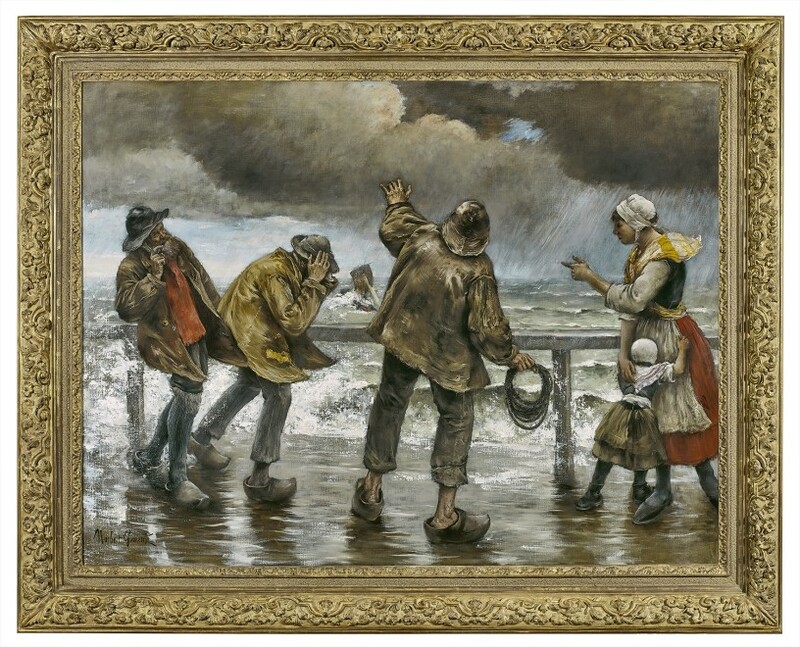 Goeneutte first exhibited at the Salon in 1876 and continued to exhibit several pictures each year from then on. Although he was closely associated and even influenced by Manet (Goeneutte’s obituaries described him as Manet’s closest disciple), as well as Degas, Goeneutte never participated in the Impressionist exhibitions, preferring instead the official Salon venue. Nonetheless, like Renoir and Monet he was represented by Paul Durand-Ruel who featured his works in several gallery exhibitions. 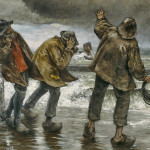 Goeneutte made trips to London in 1880, Rotterdam in 1887 and Venice in 1890, all of which provided new subjects for his landscape paintings and town views. 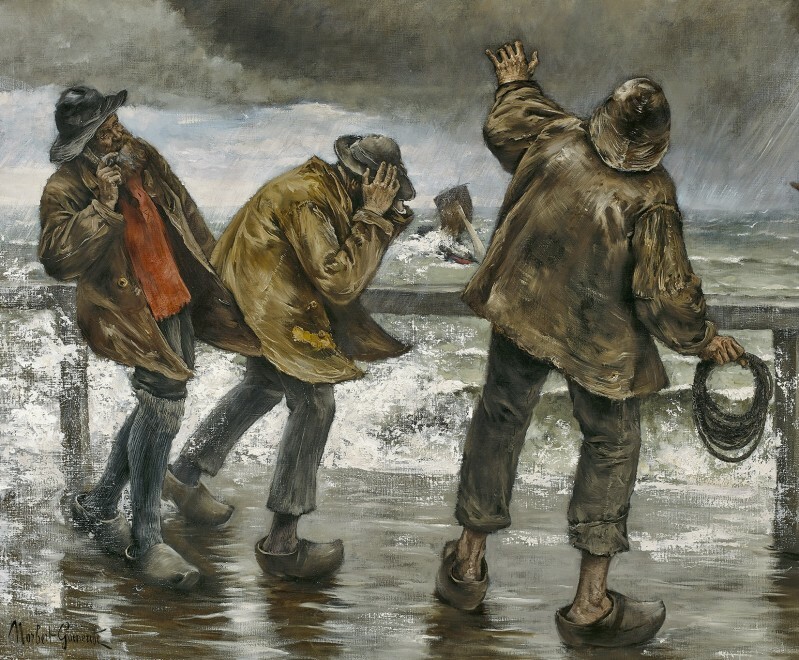 Whether painting the bourgeois society into which he had been born, Parisian street sweepers or Norman fishermen, Goeneutte did not disguise the harsh realities so many faced in late nineteenth century France. In 1891 Goeneutte moved to Auvers-sur-Oise, where Dr Paul Gachet had a studio in his home. The artist had earlier worked with Gachet on a publication, La Renaissance littéraire et artistique, in 1872 as well as on the periodical Paris à l’eau forte, and in 1892 Goeneutte exhibited a portrait of his friend the Doctor at the Salon. Goeneutte was an accomplished engraver and illustrator providing the drawings for La Terre by Emile Zola, published after the artist’s death in 1899. The spectacle of a ship in danger was treated by Dutch seventeenth century artists and in the 18th century by the French painter Joseph Vernet but always as distant observers rather than as participants in the action. 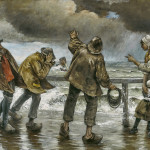 Nineteenth century maritime dramas – from the Raft of the Medusa (1819) by Gericault to Adieu (this shows a man and woman clutching the side of an overturned fishing boat and sharing a last kiss) by Alfred Guillou (1892) - intentionally increased the sense of danger and disaster but still leave the viewer as observers. 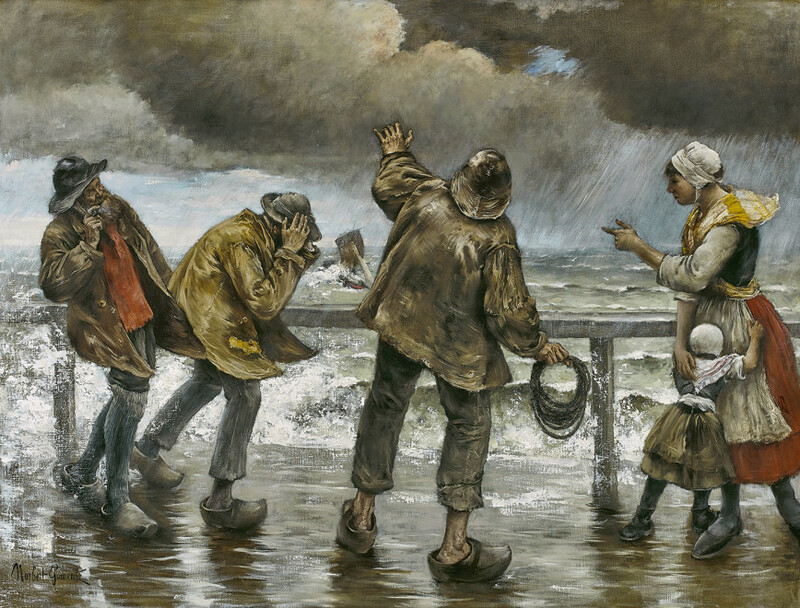 The great American painter, Winslow Homer, in his late maritime dramas involved the viewer more directly by placing the principal figures close to the foreground. 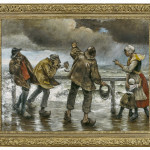 In Goeneutte’s painting the foaming spray almost envelopes the viewer as well as the fishermen and young mother hiding the face of her terrified child from the scene unfolding before them. Like them we are made immediately aware that there is nothing we can do to stave of potential disaster when faced with the overwhelming power of the sea. This painting has been authenticated by M. Duvivier, Curator at the Musée Tavet-Delacour, Pontoise, France.